The management of beleaguered Kingfisher Airlines today managed to broker a deal with disgruntled employees ahead of the F1 Grand Prix in which airline promoter Vijay Mallya holds a major interest. The 26-day deadlock was resolved with the management agreeing to pay four months� dues by December-end to the striking employees, who have not received salaries since the past seven months. Ace comedian, satirist and film producer Jaspal Bhatti died in a road accident near Shahkot today. 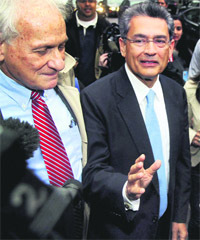 Disgraced Wall Street titan Rajat Gupta was today given a lighter sentence of two years in prison and slapped with a fine of $5 million by a US judge who termed the Indian-American�s insider trading crimes as �disgusting� and a �terrible breach of trust�. The police today claimed to have foiled a major terror bid ahead of the festive season by arresting four persons armed with sophisticated weapons and ammunition at Amritsar, Ludhiana and Bathinda railway stations. All-India Congress Committee general secretary Rahul Gandhi today alleged the BJP government in Himachal had exploited the poor by selling their land to the rich. Senior BJP leader and Leader of the Opposition in Lok Sabha Sushma Swaraj today said the days of the Congress-led UPA government at the Centre were numbered and the people would vote out the corrupt regime which was embroiled in numerous scams in the next General Election. The average Himachali may be poor and surviving on government subsidies, but the assets of their elected representatives have increased by a whopping 172 per cent. The Supreme Court has issued notice to the Centre, seeking its response within six weeks on a plea for a �separate and distinct� identity for Sikhs in laws relating to succession, adoption, divorce and maintenance.